The race was won by Jenson Button driving for Brawn after starting from fourth on the grid. Sebastian Vettel finished second for Red Bull and Jarno Trulli finished third for Toyota. McLaren's Lewis Hamilton drove to a season's best fourth position, followed by the second Brawn of Rubens Barrichello. Kimi Räikkönen picked up Ferrari's first points of the season in sixth, whilst Toyota's Timo Glock and Renault's Fernando Alonso finished in seventh and eighth position. Going into the round, Brawn GP driver Jenson Button led the Drivers' Championship by 6 points from teammate Rubens Barrichello. Barrichello led Sebastian Vettel of Red Bull Racing and Timo Glock of Toyota F1 by 5 points in second. Brawn GP led the Chinese Grand Prix winners Red Bull Racing by 16½ points in the Constructors' Championship. Toyota were a further point back and the only other team to hit double figures. Ferrari were yet to score a point, and failure to do so in Bahrain would have resulted in Ferrari's worst ever start to a season in Formula One. Their previous worst start also came when they were Constructors' Champions; in the 1980 season the team scored no points until the fourth race, the 1980 United States Grand Prix West, where Jody Scheckter finished fifth. Force India introduced a revised floor and diffuser in Bahrain for the Force India VJM02, as well as an upgraded front wing and reprofiled sidepods. Force India driver Giancarlo Fisichella welcomed the upgrades, hoping the car's lack of downforce would be addressed by the new modifications. Three practice sessions were held before the race; of which two were held on Friday April 24, 2009, with the first in the morning and the second in the afternoon. Both sessions lasted 90 minutes with weather conditions hot and dry throughout. The third session was held on Saturday morning and lasted for 60 minutes. At the end of the first practice session, Lewis Hamilton set the fastest time of 1:33.647 in his McLaren car, ahead of the two BMW Sauber cars of Nick Heidfeld and Robert Kubica. Williams' Nico Rosberg continued his quick practice form with the fourth fastest time, followed by the Brawn of Jenson Button, the McLaren of Heikki Kovalainen, Brawn's Rubens Barrichello, and Ferrari's Felipe Massa. Red Bull's Mark Webber and the other Ferrari of Kimi Räikkönen shared the ninth fastest time, completing the top ten. Nico Rosberg was fastest in Friday's second practice session, topping the timesheets with a time of 1:33.339, followed by Fernando Alonso in the Renault and Jarno Trulli in the Toyota. The Red Bulls of Sebastian Vettel and Mark Webber were fourth and fifth, with Button close behind. Adrian Sutil of Force India put in an impressive laptime to finish seventh in the standings, with Toyota's Timo Glock, Brawn's Rubens Barrichello, and Williams' Kazuki Nakajima rounding out the top 10. The BMWs of Heidfeld and Kubica could not repeat their times from the first session, and were classified in seventeenth and twentieth, respectively. Nelson Piquet Jr. qualified his Renault in fifteenth place; his teammate Fernando Alonso was seventh on the grid. In third practice, Glock managed the fastest time with a 1:32.605 before his car rolled to a halt due to brake problems, and there were improved times from Ferrari and McLaren. Felipe Massa managed the second fastest time, with Räikkönen in fifth. Rosberg was third fastest, and Hamilton posted the fourth fastest time. Nelson Piquet, Kubica, Nakajima, Trulli and Heidfeld made up the top ten. The qualifying session on Saturday afternoon was split into three parts. Jarno Trulli achieved his fourth career pole position, and his first since 2005, whilst his teammate Timo Glock qualified second. This marked the first time Toyota had put both cars on the front row of the grid. Sebastian Vettel qualified third, with Jenson Button behind him. In fifth was the McLaren of Lewis Hamilton, with Rubens Barrichello in sixth. Renault's Fernando Alonso managed seventh place, and behind him Felipe Massa, Nico Rosberg and Kimi Räikkönen completed the top ten. Kovalainen, Nakajima, Kubica, Heidfeld and Piquet made up 11th to 15th on the grid. Those knocked out in the first session and classified 16th to 20th were Sutil, Buemi, Fisichella, Webber and Bourdais. Webber was controversially blocked by Sutil near the end of his qualifying lap (Sutil claimed he didn't realise Webber was on a flying lap), preventing him from posting a fast time. As a result, the stewards gave Sutil a three-place grid penalty, demoting him to 19th position. Timo Glock got off to a perfect start from second on the grid and took the lead. Jarno Trulli was running second, but had to fight off Lewis Hamilton in the first corner, who had passed Jenson Button and Sebastian Vettel from fifth on the grid after a flying start with the help of his KERS. Button had also overtaken Vettel, who was running a heavier fuel load. Kimi Räikkönen, meanwhile, had pushed his Ferrari up to sixth place, making up four positions from the start. Further back in the field, there was damage sustained to the cars of Felipe Massa, Nick Heidfeld, Robert Kubica and Kazuki Nakajima, all of whom had to pit early to replace their front wings, whilst Heikki Kovalainen lost track position after running wide. Massa also complained of problems with his KERS system due to a temperature problem, and was advised to turn it off. At the start of lap 2, Button overtook Hamilton to claim third position. The KERS-aided McLaren of Hamilton then kept Vettel's Red Bull at bay, and only when Hamilton entered the pits on lap 15 did Vettel finally pass him. Since both the Toyotas were running light on fuel, they made their pit stops early, with Glock in on lap 12 and Trulli on lap 14. The Toyota team opted to put both their drivers onto the slower, harder compound tyres for the middle stint of the race, opposite to the strategy being run by the other teams. By the time Button had made his stop on lap 15 on the softer tyres, he had made up enough ground over Trulli in just one lap to come out in front. Glock, who had once led the race, had lost so much time on the tyres that he stayed behind Hamilton in seventh place even after the McLaren driver had completed his pit stop. Vettel's pit stop on lap 18 placed him ahead of Hamilton, but just thirty metres behind the slower-lapping car of Trulli, preventing him from challenging Button for the lead. Button took this opportunity to pull out a 7.5 second gap between himself and Trulli by lap 22. By lap 34, Button had increased his lead to 15.6 seconds, putting him in clear control of the race. By the time the second round of pit stops were completed for the front runners, Button was ahead of anyone else, this time on the harder tyres. Toyota's tyre strategy had not paid off, and Vettel, on the softer tyres, put in some fast lap times once Trulli had his second stop and was no longer in Vettel's path. After his own stop, Vettel (now on the harder compound tyre) ended up just in front of the Toyota driver, the very opposite of the situation after the first pit stops. On lap 44 there was drama with Räikkönen and Glock fighting for sixth position, with the Finn just edging out Glock at turn four. Rubens Barrichello had lost a lot of time earlier in the race after failing to pass the KERS-equipped Renault of Nelson Piquet. However, he showed the pace of the Brawn car by ending up just in front of Räikkönen, even after having one pit stop more, then pulled away from him in the final laps. On lap 48, spiking oil pressure on the Williams of Nakajima caused the only retirement of the race as he crawled into the pits. Button drove home to his third victory of the season, 7 seconds clear of Vettel, who was pushing particularly hard in the last laps. Trulli crossed the line 2 seconds behind Vettel, with Hamilton finishing fourth. Barrichello took fifth, Räikkönen sixth, Glock less than a second behind in seventh, and Fernando Alonso finished eighth, 52 seconds behind Button. Nick Heidfeld equalled Michael Schumacher's record of 24 consecutive finishes, bringing home his BMW Sauber in 19th and last place. ^1 Adrian Sutil was issued a 3 place grid-penalty for impeding Mark Webber during qualifying. Wikimedia Commons has media related to 2009 Bahrain Grand Prix. 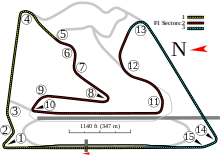 ^ "Bahrain Grand Prix Preview". Fédération Internationale de l'Automobile. 2009-04-22. Archived from the original on July 25, 2009. Retrieved 2009-04-24. ^ "Ferrari predict end to poor form". BBC Sport. 2009-04-19. Archived from the original on 22 April 2009. Retrieved 2009-04-22. ^ "New floor and diffuser for Force India in Bahrain". Formula 1.com (Formula One Administration Ltd). 2009-04-22. Archived from the original on 24 April 2009. Retrieved 2009-04-24. ^ a b "Bahrain GP practice results". BBC Sport. 2009-04-24. Archived from the original on 27 April 2009. Retrieved 2009-04-24. ^ "Bahrain GP practice results". BBC Sport. 2009-04-25. Archived from the original on 27 April 2009. Retrieved 2009-04-25. ^ "Bahrain GP qualifying results". BBC Sport. 2009-04-25. Archived from the original on 27 April 2009. Retrieved 2009-04-27. ^ "Trulli on pole as Toyota dominate". BBC Sport. 2009-04-25. Archived from the original on April 28, 2009. Retrieved 2009-04-27. ^ "Martin Brundle column". BBC Sport. 2009-04-27. Archived from the original on 30 April 2009. Retrieved 2009-05-06. ^ "Brilliant Button wins in Bahrain". BBC Sport. 2009-04-26. Archived from the original on 28 April 2009. Retrieved 2009-04-27. ^ "2009 FORMULA 1 GULF AIR BAHRAIN GRAND PRIX - Qualifying Results". formula1.com. Archived from the original on 12 June 2014. Retrieved 28 December 2015. ^ Elizalde, Pablo (2009-04-25). "Sutil handed three-place penalty". autosport.com. Haymarket Publications. Archived from the original on 28 April 2009. Retrieved 2009-04-25. ^ "2009 FORMULA 1 GULF AIR BAHRAIN GRAND PRIX - Race Results". formula1.com. Archived from the original on 18 January 2015. Retrieved 28 December 2015. ^ a b "Bahrain 2009 - Championship • STATS F1". www.statsf1.com. Retrieved 11 March 2019.